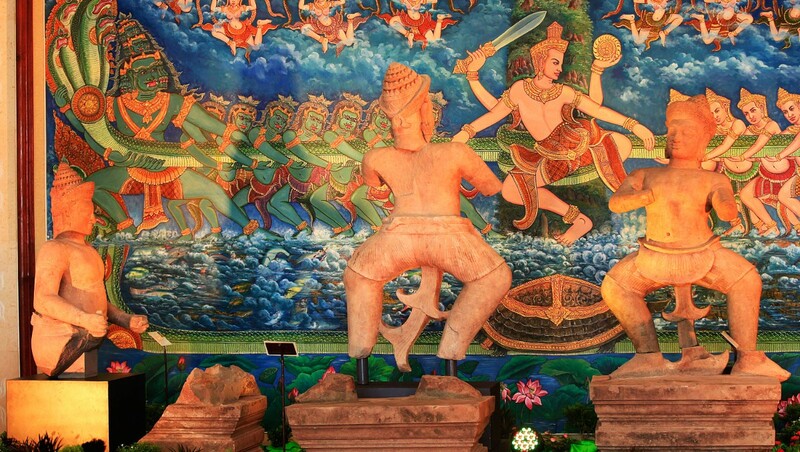 There’s a nice article on a norwegian site about a thousand year old stolen statues of Duryodhana, Balarama and Bhima has been recovered and taken back to Cambodia. The image above is of the three statues. The statues are large, the one of Duryodhana is 158 cm tall (which is about my size). I suddenly picture myself standing among these statues and suddenly I’m at Kuruksethra where it all happened. 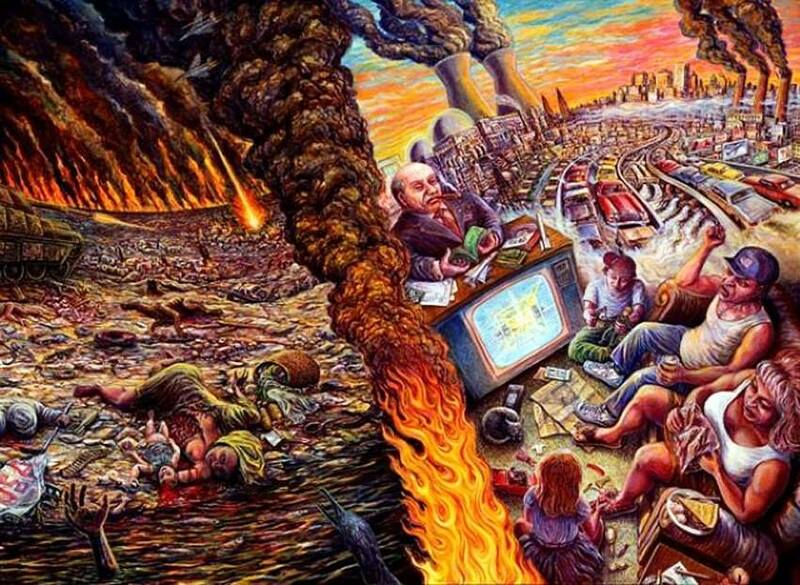 Suddenly it looms on me that the setting of Bhagavad-gita is war. Imminent war of killing ones family member. How dramatic it is; furthermore, I’m a vegetarian because I don’t want to harm living beings, and here they are in a situation where they have to kill family members. Just look at the wall hanging/painting behind those statues. Today is the Appearance Day celebration of my spiritual uncle, Srila Bhaktivedanta Trivikrama Maharaja, the beloved Godbrother of my Gurudeva, Srila Bhaktivedanta Narayana Goswami Maharaja. Once, Sudevi and Anu Radha were in his room and he was affectionately ‘harassing’ them with questions. So I had to enter the room. He was very strong in his classes, so I was a bit timid. He was so simple, yet so profound. I loved his classes. They were a bit heavy, but I needed it. They always grounded me. 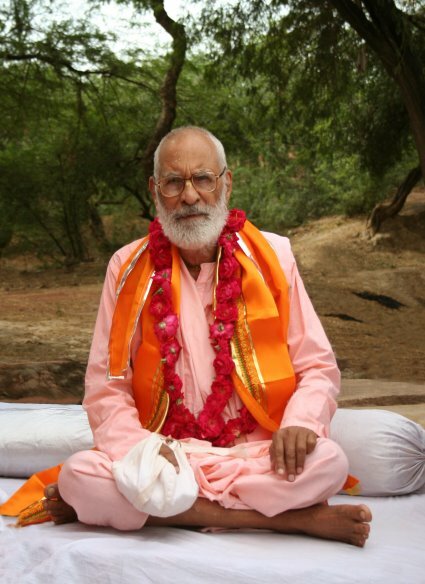 Srila Gurudeva would always lovingly argue with him. Pujyapad BV Trivikrama Maharaja would say something like, “Candravali is the best devotee of Krsna.” And he would give his reasonings. This would cause Srila Gurudeva to become very enthusiastic to prove the superiority of Srimati Radhika. I remember once that this conversation continued for quite a long time. We were out on Parikrama at Rama Ghata, and it still continued. They walked together to take acamana at Yamuna River and the arguing still continued. 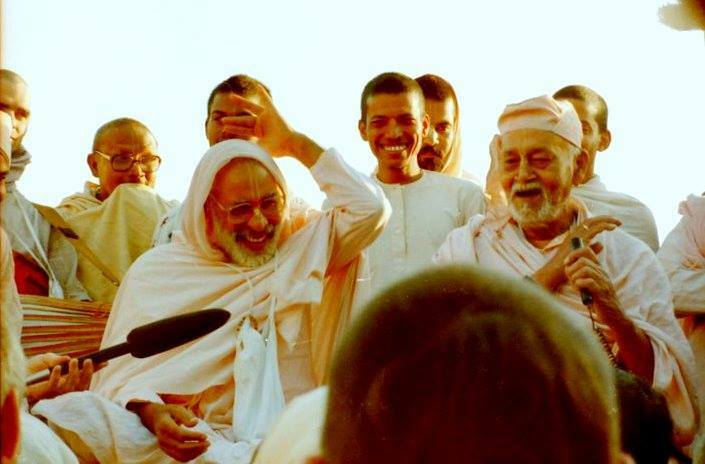 Finally, Srila Gurudeva jokingly said to him, “Anyhow, they all came to hear me speak, not you!” They were both laughing. Srila Gurudeva walked ahead and Maharaj was just laughing and shaking his head. Later on, that same day, at Biharvan (where all the cows are), Maharaja sang Radhe Jaya Jaya Madhava Dayite, his eyes full of tears.